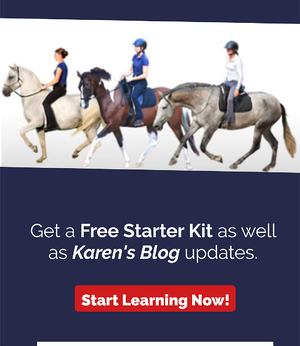 Q: In dressage we have to do so many circles… Won't my horse become bored and dull? A: I have seen a lot of 'interesting' looking circles in my time as a teacher of dressage... But at a recent clinic I had several students comment that they never realized circles could be so interesting! At the end of the course two students pulled me aside to tell me that they had been hesitant and a little concerned about coming to a 4½ day dressage clinic because their horses were really unmotivated in arenas. One said that it was a big problem and things could get pretty ugly when her horse turned off and had had enough. What was really interesting is that I had no idea! Their horses had been lovely and quite willing. For one, I had spent the last sessions letting her know she could slow her tempo! So how could this be so? We sure did a lot of physical exercise so it couldn't be that they were just fresh from standing around! The first exercise I do in the clinic is to make sure we are starting in relaxation, and that we can talk to our horses about being relaxed ... that they know when the game is over. Then the next thing we look at is our conversation about the gas pedal. We get VERY particular ... expecting nothing less that 100% matching of our suggestion ... but for only a moment. When this is willingly communicated and offered, we play with strategies for causing our horses to sustain our chosen energy level ... 100%... while the riders remain in neutral. A tall order for sure! So, shouldn't the horses feel this is too demanding? Shouldn't this make them want to not participate? Wouldn't this be a nightmare for any happy-go-lucky horse? What happens is quite the opposite. Add to this the Basic Alignment Exercise I discuss in my book/DVD and all the aids and suggestions we make to our horse to cause him to find a more comfortable, relaxed, energized and balanced way of moving ... Sure sounds like that would feel good, doesn't it? It does feel good ... even to the horse! All of the basic biomechanics are FOR the horse. Sometimes we have to work hard to get to a place where we don't have to work hard. When you get that particular and that pure in your conversations with your horse, things not only get more comfortable, but they become very very interesting! It was so fun to see the horses come alive and become more engaged, inspired and free, offering more power each day, all seemingly with less effort. It is fun for me when I see students discover that by riding the body well, the mind and emotions can also improve.